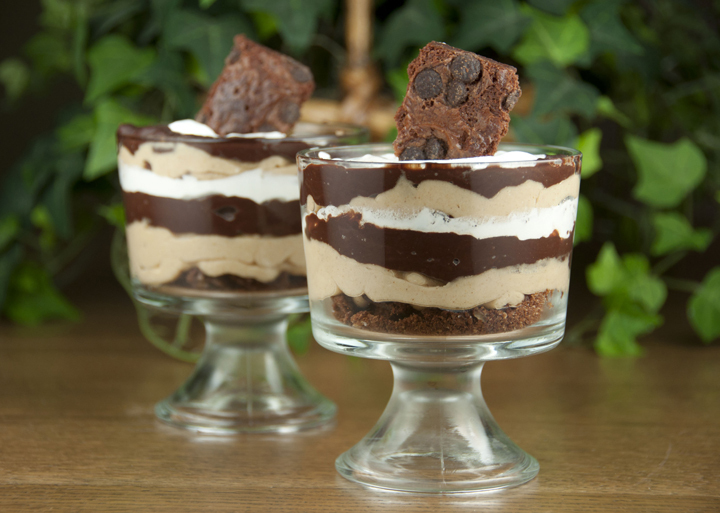 Brownie Brittle Chocolate Peanut Butter Parfaits made with chocolate chip Brownie Brittle for a rich, decadent dessert recipe idea for the chocolate lover in your life. Congratulations, Lisa! Thank you to everyone who entered. I went to my first food bloggers’ conference in Miami back in may through BlogHer and had the best time and made SO many new friends. It was cool being around hundreds and hundreds of other people who are just as obsessed passionate about food and in the same field of “work”. I say “work” in quotes because this has never felt like a job to me but more of a fun hobby for the past 3 years. I was sent a sampler pack to try. Their flavors are: Chocolate Chip, Mint Chocolate Chip, Toffee Crunch and Salted Caramel – all of which I’m giving away today! My favorite was the salted caramel and my hubby’s favorite was the mint chocolate chip (which is surprising because normally neither of us are too keen on mint.) They are all absolutely delicious! The salted caramel had just enough salt and sweet. The Mint Chocolate Chip actually has a similar taste to an Andes dinner mint. The brownie brittle is made with natural ingredients and is just like having a whole bag of crispy brownie edges, without having to bake! You get a great brownie flavor with the crunch of a cookie. I give this product a big thumbs up and you will too. You will just die over these parfaits. 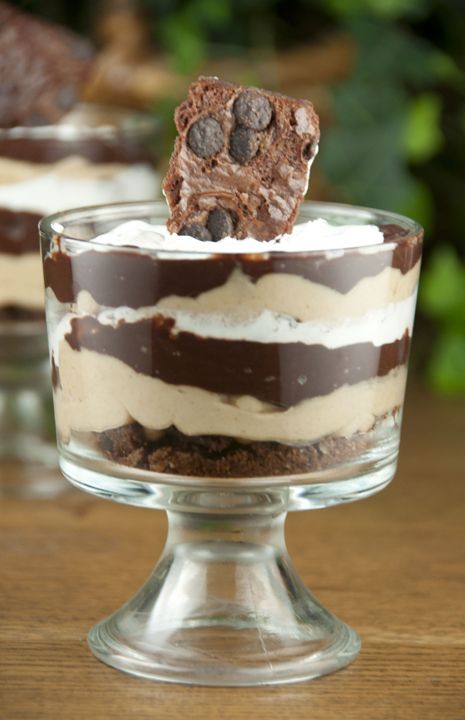 In my opinion, the ideal dessert combines the flavors of chocolate and peanut butter so when I came up with this rich parfait treat I knew it was going to be good. They are amazingly good and a great after-dinner dessert to serve to company because they look all fancy with those layers and all! The Brownie Brittle made a great “crust” to these parfaits and I think you will agree. The more chocolate, the better, right?! 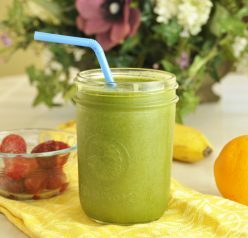 Scroll down to get the recipe and enter the giveaway! Combine the peanut butter, cream cheese, and powdered sugar in a large bowl. Mix together until combined (mixture will be thick). Stir in the whipped topping. Save about a cup to add on top at the end (this is optional). You can also added more crushed Brownie Brittle to the top. Up to you. In a separate microwave-safe bowl, add the milk and chocolate chips. Microwave in 30 second intervals stirring after each cycle until chocolate is completely melted. (About 1 minute 30 seconds). Start with a layer of crumbled Brownie Brittle. Add a layer of the chocolate ganache. Add a layer of whipped topping (I did this with a spoon). Repeat layers enough times to use up all of the ingredients evenly. Top with whipped topping (optional) and a piece of Brownie Brittle. Cover with plastic wrap and store in the refrigerator. 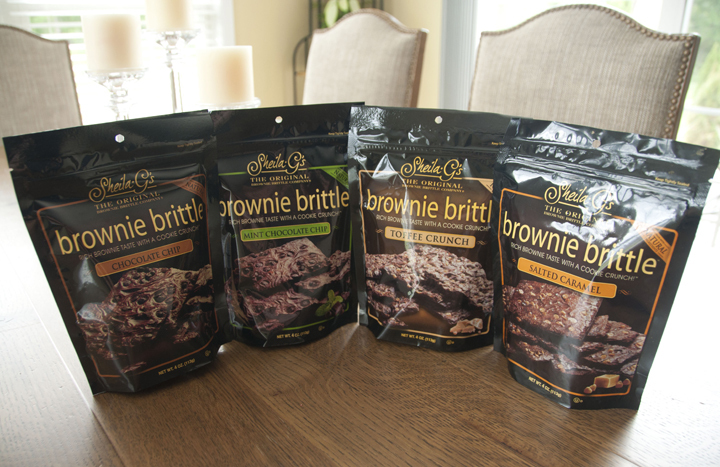 Thanks to Sheila G’s Brownie Brittle, one lucky Wishes and Dishes reader will win 4 bags of this Brittle (pictured above)! Many thanks to them for providing the review and giveaway product. Giveaway is open to U.S. readers. 1. Subscribe to Wishes and Dishes by email.. Come back and let me know you’ve subscribed in an additional comment on this post. 2. Follow @wishesndishes on Twitter. Come back and let me know you’ve followed in an additional comment on this post. 3. Follow Wishes and Dishes on Pinterest. Come back and let me know you became a fan in an additional comment on this post. 4. Become a fan of Wishes and Dishes on Facebook. Come back and let me know you became a fan in an additional comment on this post. 5. Follow Wishes and Dishes on Instagram. Come back and let me know you’ve followed in an additional comment on this post. Deadline: Sunday, July 20, 2014 at 11:59pm EST. Winner: The winner will be chosen at random using Random.org and announced at the top of this post. I will email the winner and if he/she does not respond within 48 hours, another winner will be selected. Disclaimer: Sheila G’s Brownie Brittle gave me these products and is also mailing them out to the winner of the giveaway. My opinions remain entirely my own, as always. Just got back from a quick weekend vacation and now all I can think about are these parfaits. They look so incredibly good!!! I’ve always been a mint chocolate chip girl, so I would try that one first! 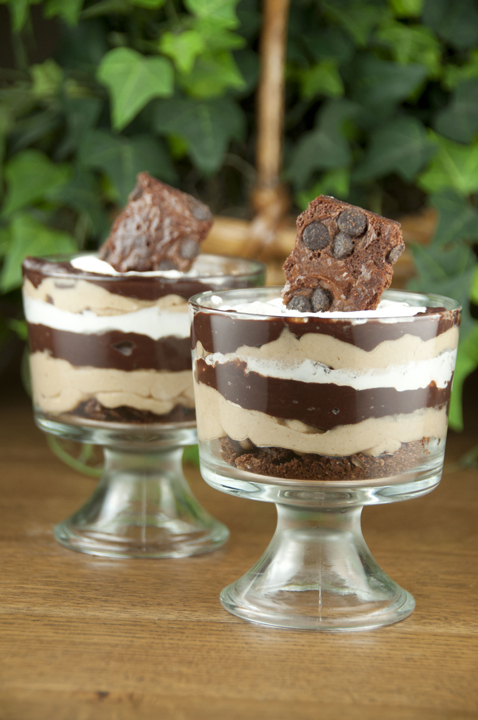 Mmmmm that brownie brittle looks delish and the parfaits are the perfect way to utilize ’em! This parfait is my kind of dessert, Ashley! What a fun trifle and that brittle sounds great! I really need to try this brownie brittle everyone keeps raving about!! Love the sound of these parfaits! And with chocolate and peanut butter and brownie brittle?? I mean how can you go wrong! I would definitely love the salted caramel flavor! You crazy girl! This looks delicious!!! I sampled this brownie brittle at Costco a long time ago and loved it so much I thought I’d better not buy it — it would be addicting for me! These parfaits look like a great way to use this brittle…delicious, Ashley! I would start with the mint chocolate kind! I word definitely go for the salted caramel first…followed closely by the chocolate chip. I follow Wishes and Dishes on Facebook. I subscribed to the Wishes and Dishes mail. I would try the salted caramel! They all sound delicious though! I’d like to try the salted caramel first! I’ve tried them all but I haven’t used them to cook with. What a great idea! I’ve never heard of Brownie Brittle before. Interesting concept! That dessert looks amazing, can’t wait to try it! I would try the toffee crunch first! I want want want the Mint Chocolate. It would be gone in a heartbeat! I know I won’t be able to resist any of these….but first, I gotta try the Salted Caramel one! Sounds so decadent and I’m sure I can stop at just one! Subscribed to Wishes and Dishes by email. I am a fan of Wishes and Dishes on Facebook. I follow you on pinterest, Facebook, and email. Aww I have heard such good things about the conference in Miami! You’re lucky you got to go!! These are fun! 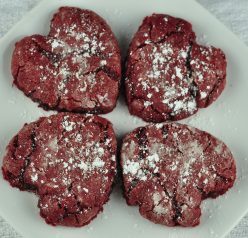 I have been making brownie cookies (hard-ish like the brittle…forever). When I first saw these I was like…huh, I should have done that lol! They are delicious and my 12 year old son can’t get enough. Who could turn down a parfait like that? Not me. I would choose the mint first…sounds yummy! I make a giant parfait in a trifle bowl, I would like to try using the brownie brittle in it! I am most interested in the mint chocolate chip variety. I keep on tabbing your recipes to make in the future that I see on here and instagram! Brownies are my kryptonite though! Yum! Toffee would be 1st…close 2nd is salted caramel! I would probably pick toffee first, but it is hard to choose they all look so good! I am a follower on Instagram too! When I saw the title of this post in my inbox – I didn’t want to open it cos brownie brittle, peanut butter and parfait in one sentence is TROUBLE! But, I have a problem controlling temptation and now am yearning for a taste of this – simply decadent dessert Ashley! I think I would LOVE that MINT CHOCOLATE CHIP flavored Brownie Brittle – thanks for hosting this giveaway! These look amazing! My kids will love them….and so easy, so they can do most of the work! 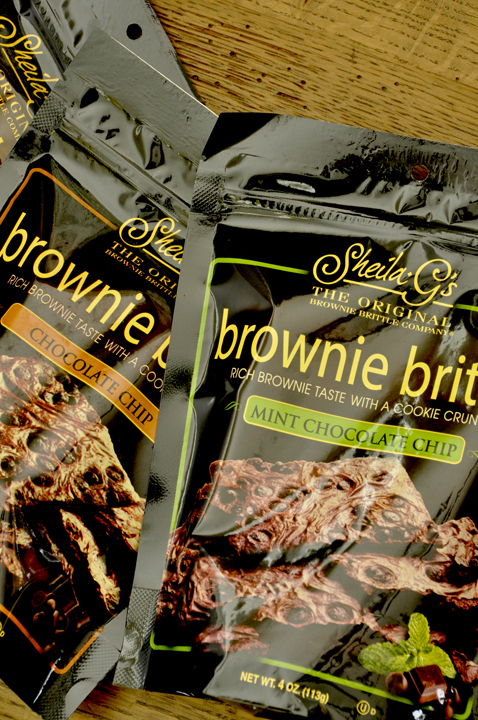 I would love to try the mint chocolate chip brownie brittle cause it sounds absolutely yummy. Follow Wishes and Dishes on Pinterest. I’m entering to win, but if not I’d like to know where to buy so I can try the brittle!! The Carmel brittle sounds wonderful! I also correct my like to follow on Twitter and Instagram. Oh and I also subscribed by e-mail! IT would have to be the salted caramel.